Fess up & admit you’re nervous! 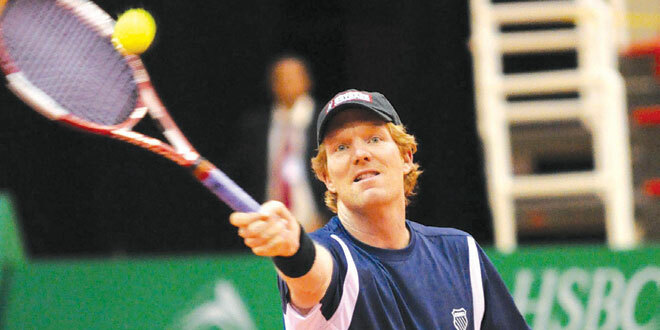 As former great player and current Davis Cup Coach Jim Courier once stated, “No one is above a choke!” Simply put, if the best of the best readily admits that they feel nerves during competition than just about anyone else should admit that they get ‘tight’ as well. But, for some strange reason, recreational tennis players just don’t want to admit that they get nervous during their CTA or USTA league matches. Why? Ego. As we’ve often heard (ok, I have to admit I’ve heard Dr. Phil say this countless times), we cannot change what we do not acknowledge. Therefore, if we avoid the truth (every tennis player will choke from time to time) there is no way to overcome the problem in the future. Like most folks, I wanted to pretend I was one of the rare tennis players who did not fade under extreme pressure. Oddly enough, once I swallowed my pride and openly admitted my on-court ‘choke-fests.’ I was immediately liberated! This admission is no different than admitting a mistake; the pressure is completely evaporated. No one is above a choke. fast easy points, the pressure mounts and our confidence dims. The remedy is to focus on our breathing; keep your eyes glued on the tennis court and exhale. If possible, hit a groundstroke with a long follow through and do not worry whether the ball lands in the court. The edgy player needs to ‘kick out’ the nerves to free up his court movement. When a doubles team has surrendered to the moment, they are also unaware of where they are standing during a big moment. For example, after a few exchanges, one of the players fetches a short ball and now is standing too close to the net. Unfortunately, her partner is caught up in the moment and does not realize how easy it is to lob her partner (who is standing too close to the net after retrieving the short ball) and does not move back to cover the lob. Unless a team communicates throughout the match, players will be out of position on a regular basis and the pressure continues. Have you ever been guilty of lobbing too frequently? When we are too rigid and move poorly, the lob is the best alternative. But, if your foe is on to you (they discover your only passing shot is a lob) they will learn to back up and hit a more powerful overhead smash. Even though the best play is the lob, it might be prudent to abandon your reliable shot and hit a groundstroke drive to diminish the stress. 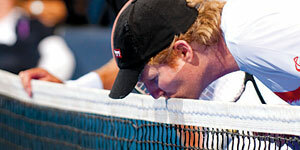 Finally, court stress can cause conservative play and we often do not put away easy shots. If you have a simple soft volley, it is imperative to move as far forward as possible. If we rely on our feet, our hands will be magic. As we drive our legs into our shots, we take the stress off our hands. The key is to put the emphasis on our lower bodies… smooth, eloquent footwork will lessen pressure and allow us to perform to our maximum abilities.